WIC and many local pediatric providers share clientele. A challenge for providers in both settings is to integrate obesity screening and client-centered counseling due to time constraint and need for user friendly office tools/system in place. “Catch 5 for a Healthy Weight” offers tools and guidance for brief client centered office-based consultation with parents of overweight or obese children. Assisting parents or caregivers to make changes toward healthier eating and increased physical activity. Catch 5 For a Healthy Weight project activities are based on the 2007 Expert Committee Recommendations on the Assessment, Prevention, and Treatment of Child and Adolescent Overweight and Obesity. 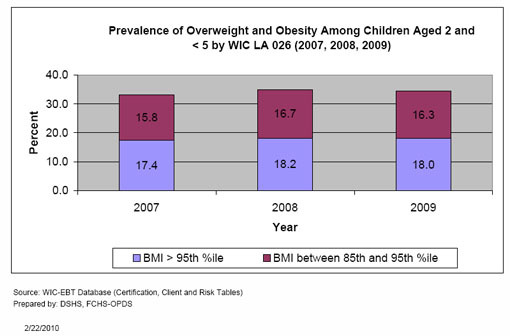 At the HDHHS (Houston Department of Health and Human Services)-WIC program, the prevalence of overweight and obese children 2 – 5 years of age is 34.4% compared to 37% among Hispanic children and 23.5% for African American Children of the same age group. 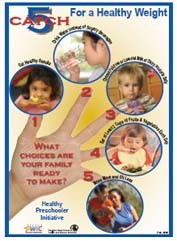 The HDHHS_WIC program obesity rate of 18% is 3.6 times the Healthy People 2010 target of 5 percent. Nationwide, the prevalence of children 2 to 5 years of age are either overweight (BMI 85th – 94th percentile) or obese (BMI ≥ 95th percentile) is approximately 28% (CDC-PedNESS).